The Four of Swords tarot card is akin to the calm and peaceful center of a hurricane. Chaos may rage a stone’s throw in each direction. But you’re right in the center of your very own Zen-space, where it’s so quiet that you can hear a pin drop. The Kabbalistic title of the Four of Swords is Lord of Rest from Strife. This means that like in the Two of Swords, this time of calm won’t last forever. The storm is continuing on its path. When the eye has passed, you’ll have to get back into the fray. But for now, the kind benevolence of Jupiter in Libra is giving you that much needed breather. The coffin in the Four of Swords card does not symbolize death, but a period of going within. The lid is open. You can see that it’s empty. You have been given some valuable downtime for reflecting on where your life is taking you. Here is a real chance to reconnect with your spirit. That’s why the knight’s hands are folded in prayer in the Four of Swords. The Grey walls of the church interior symbolize rest and inaction. So does the fact that the three hanging Swords are pointing down. In the Four of Swords, the coffin’s Yellowish Color shows that this downtime is actually quite productive. Important thoughts and insights are making their way to the surface right now. The scene in the stained glass window gives you another clue: It’s the story of the Fisher King from the Arthurian legend. Here, Sir Galahad brings the Holy Grail to the ailing King Arthur, bringing him back to health and vitality. This cosmic breather is your time to recharge those batteries. The Swords on the wall point to his head, heart, and hands: his thoughts, feelings, and actions. In a state of perfect quiet, the knight can reconnect with the fourth, buried sword: his soul. Some quests take you on a quiet journey within. A warrior’s place isn’t always on the battlefield. Sometimes, it’s in the silence of the heart and mind, and in sacred places. When the Four of Swords tarot card appears in a reading, it announces a period of creative downtime. As with all cards in the Suit of Swords, this moment won’t last forever. So it’s important to use this time wisely. Until recently, your life has been a flurry of activity. Now things have slowed down to a trickle. This may feel a little disorienting at first. If you’re running a business, you may be worried. But you can only work so many twelve-hour days in a row. So relax! You need this time to decompress. Your customers haven’t forgotten about you. And they’ll be happy to see a refreshed, revitalized you the next time. You may also find that your social life has become very quiet. Chances are, that was your own doing. If you’re the kind of person others seek out for help and advice all the time, those moments you have all to yourself are crucial for your emotional well-being. In your spiritual development, the Four of Swords tarot is a very important moment, especially if you meditate frequently. Beginners often receive “messages” during meditation. These messages can range from intuitions to verbal communications and images. But more often than not, they’re just your brain’s synapses firing at random. Your brain is bored from all this inactivity, and this is its way of entertaining itself. When that suddenly stops, it doesn’t mean that you’ve lost your gift. You’ve actually made an important breakthrough. Absolute silence is the goal of meditation. But what about all these awesome visions people see in those supernatural TV shows when they meditate? Well, those cool spells from Dungeons & Dragons don’t work, either. Hey, now that you no longer have to compete with those shows, you can put your notebook away and just enjoy them! 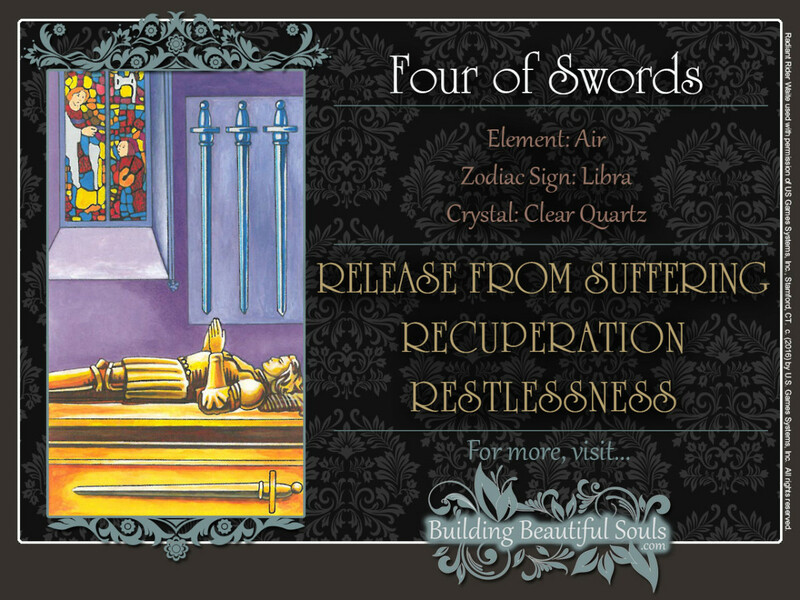 When reversed, the Four of Swords tarot card shows that the soul, that “buried” sword under the knight, is becoming restless. You’re about to jump back into the action – or you have a strong desire to do so. Here, the Four of Swords tarot card’s energy is like the moment right before you wake up from an intense dream: For example, when you talk so loudly in your sleep that you end up waking yourself up. In the Four of Swords, this could spell a return to the everyday world after a period of isolation. If you’ve used that downtime to regain your bearings and recover your strength, the transition will be very smooth. You’ll be able to handle whatever challenges come your way! You’ve spent those two awesome weeks in the Caribbean doing only what you want: scuba diving, catching rays on the beach, and dancing the night away, giving no thought to what’s happening at your workplace whatsoever. When you get back to your job, you’re ready to go, because you are rested and re-energized. Oh, and you’ll be sporting a tan your coworkers will be the talk of the office for the next few weeks! If you’re returning from a time of spiritual solitude, getting used to the gravity of Planet Earth may take some time. Remember that you were put in this world for a reason. But true spirituality does not try to avoid the challenges of everyday life. It brings spiritual energy into the everyday world. When reversed, the Four of Swords tarot may also point out that you’re not comfortable with slowing things down. Your mind really wants to work a few more hours so you can get ahead of that deadline. After all, who needs sleep? Spinning your wheels will do you no good, at all. Kabbalistically, fours are associated with Jupiter’s benevolence. In traditional Numerology, 4 corresponds to the deeply spiritual nature of Uranus. Here, these energies combine to invite you on an inner journey during your time of peace. Beautifully written! I was taken aback to see the astrological connotations of the card. In fact, as we speak, Jupiter is in Libra opposite Mars, Eris and Uranus in Aries! Can’t have a purer occurrence of synchronicity. Thank you for the words. It brought me a lot of peace.